One of the bride’s biggest excitements during her wedding planning is the amount of bridal jewellery sets she gets to wear! Especially Indian brides are said to look incomplete without the grand and extravagant Indian bridal jewellery. Bridal jewellery adds that festive aura to any outfit and makes the bride appear truly resplendent. 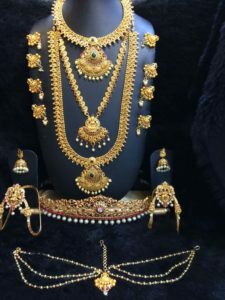 In the Indian wedding context, with the importance attached to bridal jewellery, and the sky-rocketing prices of gold and precious stones, getting your bridal jewellery on rent is a great option! Make sure you pick your jewellery sets after finalizing your muhurtam or reception outfit, so as to make sure they match and don’t clash. Choose jewellery that goes with the genereal look you’re aiming for, including how it sets off your hairstyle and makeup. Also, remember to pick bridal jewellery that you can use again! Here are some famous and celebrated varieties of bridal jewellery from all parts of India that you can opt for on your wedding! Kundan jewellery is one of the most expensive types of bridal jewellery available, for its quality and masterful workmanship. 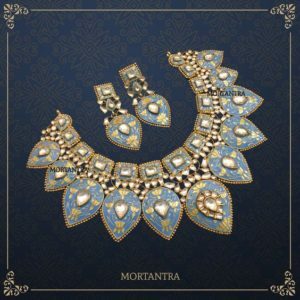 Under the patronage of many Rajasthani aristocrats, this mughal jewellery has attained perfection and is just right for any bride who wants a fabulous and traditional jewellery set! South Indian bridal jewellery would not be complete without this precious metal. 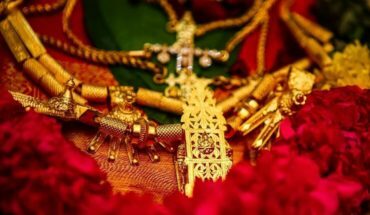 Most brides, even if wearing modern jewellery for the reception, always opt for traditional gold jewellery for the muhurtam wedding ceremony. Gold jewellery comes in various designs and patterns, specialized for each region. 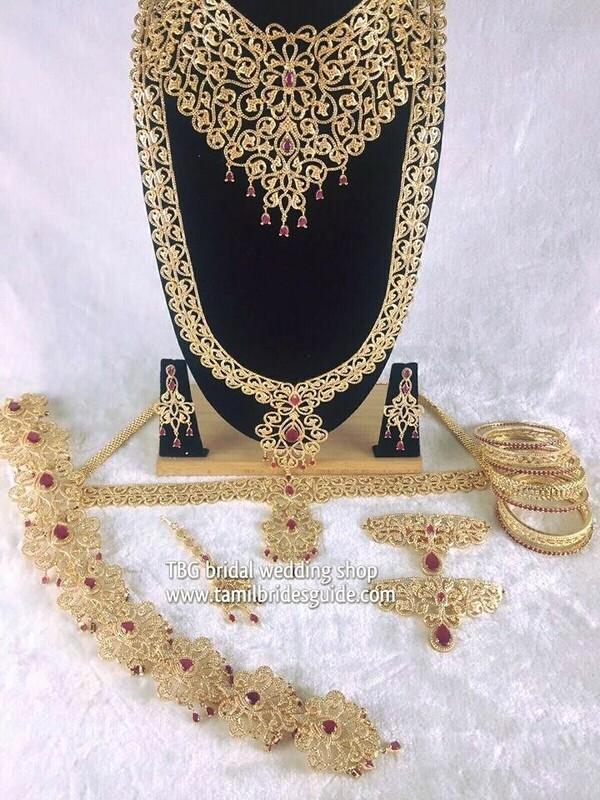 Choose from TBG’s collection of stunning gold bridal jewellery sets on rent! Diamonds are a girl’s best friend. Or a bride’s best friend. Diamond bridal jewellery goes with most outfits, and gives a classic and elegant look while spreading that rich and affluent atmosphere to the wedding. They’re a great choice if you want to make your appearance grand while avoiding the brightness and sometimes gaudiness of gold. 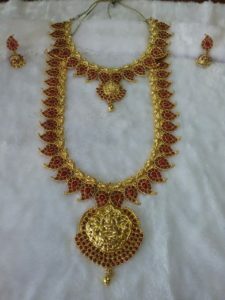 One of the most traditional types of bridal jewellery, Kaasu malais are made with gold coins or small mangas strung together to make a beautifully perfect south Indian bridal necklace. They are also sometimes set with precious stones. They are the perfect traditional accompaniment for your muhurtam silk! Gold and silver bridal jewellery designed with filigree work give a royal feeling, and elevate the bridal outfit. 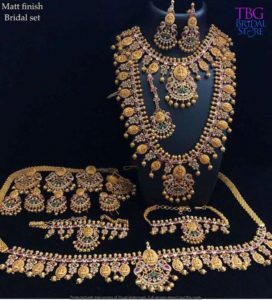 These filigree jewellery sets give a exotic charm to the bride’s appearance and are a fantastic choice for trendy and elegant outfits! Antique Jewellery pieces usually have an ethnic, old-fashioned charm with their burnished gold and copper metal finish and its subtle shine. They don’t sparkle like new jewellery, but they sure have the lure of the antique finish! Mangas are the embodiment of Indian tradition. 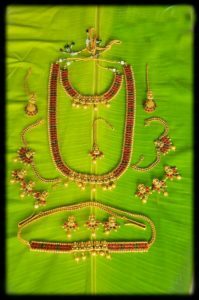 Symbolising fertility and prosperity, mangas are a design often seen in south Indian bridal jewellery. 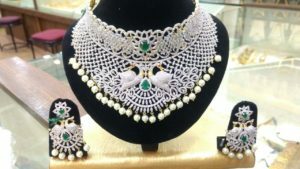 They are set with precious stones too and sometimes include peacocks or other symbols of Indian culture. 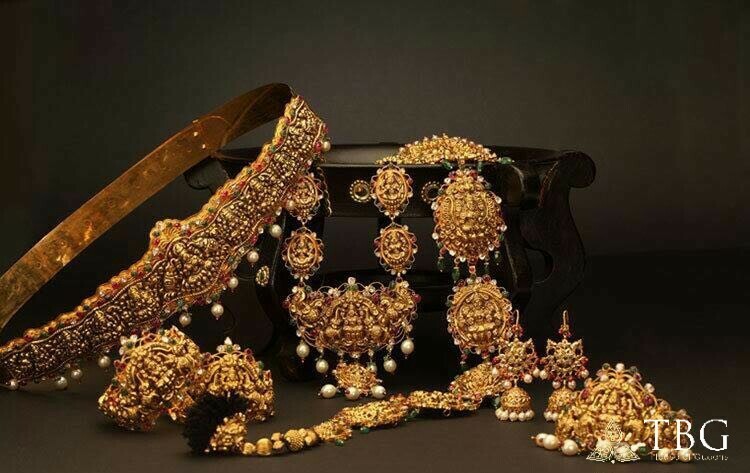 Traditional bridal gold jewellery doesn’t get better than this! These jewellery sets made with nine precious stones are believed to bring good luck to those who wear it. 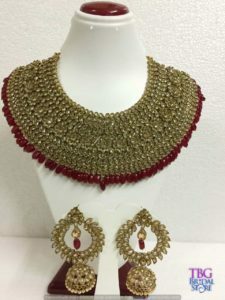 The sheer grandeur of a necklace made with so many kinds of precious gems speels luxury at your wedding and adds that extra glamour to the bridal attire. If you’re looking for the accessory that sets you off from the rest, look no further! Originating from Persia, this form of bridal jewellery is famous for its brilliant colour. Gold designs on enamel and embedded kundan stones are specialities in meenakari jewellery to watch out for! Some pieces of Meenakari have different patterns on either sides and are wearable on both sides! How cool is that for re-usable bridal jewellery? Did you find this blog useful in helping you know about more options for your bridal jewellery? Leave your suggestions or queries in the comment section below.